LG launches G5 modular phone with 'Hi-Fi Plus' DAC | What Hi-Fi? The first press conference at Mobile World Congress 2016 saw LG reveal the first flagship phone of the year, the G5. 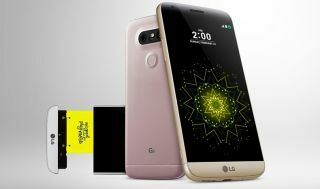 LG wants the G5 to make smartphones exciting again, and hopes to do so with a 'full metal unibody' phone that comes with a 'modular type' design for upgrading components, from the slide-out battery to the DAC. Launched alongside the LG G5 was the Hi-Fi Plus DAC, designed with Bang & Olufsen and supporting 32-bit 384kHz high resolution audio and DSD playback. It can be used as a module with the G5 phone or as a standalone DAC. The G5 also supports aptX HD and Dolby Digital Plus audio. As well as the DAC, the G5 will be offered with a set of B&O H3 earphones and there's a new LG Tone Platinum (HBS-1100) Bluetooth headset, built in partnership with Harman-Kardon. The headset is the first to support aptX HD, compatible with 24-bit wireless audio. As well as the Hi-Fi Plus DAC, LG announced a whole host of 'LG Friends' companion devices. Those devices include the LG 360 VR, a set of virtual reality goggles that work with the G5 phone to simulate a 130-inch screen, the LG 360 CAM, a compact 360-degree angle camera module, and the LG Rolling Bot, a BB-8-style companion bot that works with the G5 phone. Elsewhere on the G5 phone itself there's a 135-degree wide-angle camera lens, an 'always-on' display, and that metal and glass body design. The phone has a 5.3in display with a 2560 x 1440 resolution (554ppi), plus the Qualcomm Snapdragon 820 processor. As well as a replaceable 2,800 mAh battery, there's a microSD card slot, allowing you to boost the 32GB memory. Running the Android 6.0 Marshmallow operating system, the G5 measures 149.4 x 73.9 x 7.7mm, and weighs 159g. Available in silver, gold, pink and 'titan', pricing and release date information is set to follow.